ARE YOU STUCK ON A JOB AND WISH TO CHANGE? ARE YOU IN SEARCH OF SOMETHING MORE FULFILLING? DO YOU FEEL LIKE YOU HAVE SO MUCH TO GIVE BUT LACK THE PROPER MOTIVATION OR PLATFORM TO DO SO? OR ARE YOU SATISFIED WITH WHERE YOUR LIFE IS RIGHT NOW, BUT JUST WANT TO GROW INTELLECTUALLY? 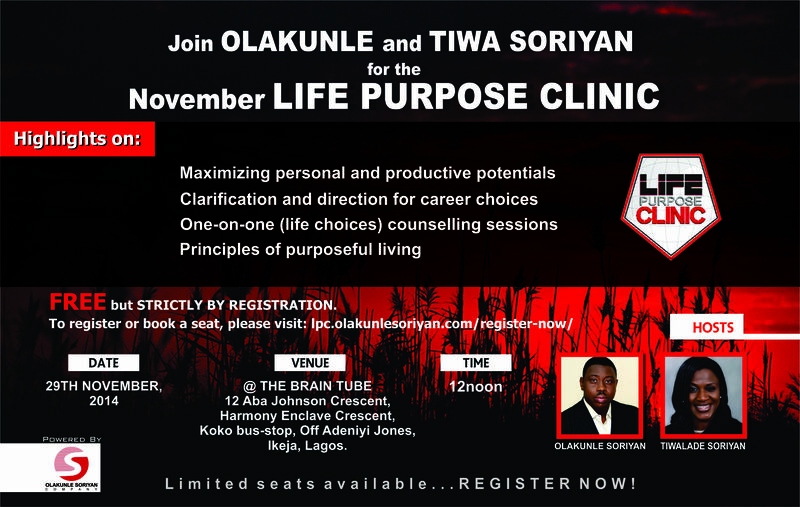 IF YOU ANSWERED YES TO ANY OF THE QUESTIONS ABOVE, THEN THE NOVEMBER LIFE PURPOSE CLINIC IS FOR YOU. IT IS FREE BUT STRICTLY BY REGISTRATION. VISIT lpc.olakunlesoriyan.com AND REGISTER NOW.